Cooking is a highly inefficient process whether it’s done in the developing world or in a modern home. If you’re cooking a meal and also heating up your kitchen is a good indicator of the inefficiency of the process. Your stove is then operating more as a room heater than a cooking device. The goal of this project was to cook a meal with as little wood as possible. Cooking is a basic human need; however, little work has been done on how to make this process truly efficient. I estimated that people consume about 5 lbs of hot food per day. Heating this food from room temperature to boiling if done with 100% efficiency requires only 700 BTUs, or 200 watt hours, this is the amount of energy in 1.5 oz of wood. This energy could also be supplied by a 50 watt solar module on a typical solar day. Even if this process were only an assumed 33% efficient the quantity of wood required would be only 4.5 oz, and a single 150 watt solar module could supply the required energy. The cost of PV is now about $1.00 per watt*(this does not include associated components such as a mount, wire, etc). If a baby was given a gift of a 150 watt solar module it could supply the energy he needs for cooking for the rest of his life. A concept we have employed, Solar Hybrid Cooking, could reduce the energy required for cooking even further. 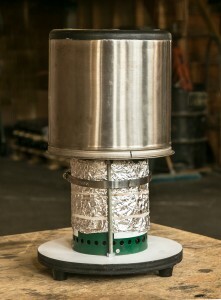 Solar hybrid cooking (http://www.sunfrost.com/extreme_efficiency.html) incorporates 3 elements; preheating with solar, a renewable heat source to bring the liquid to boil, and an insulated container to keep the pots contents at a simmering temperature after it is removed from the stove. 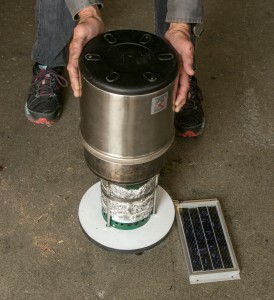 Pot used as solar preheater. 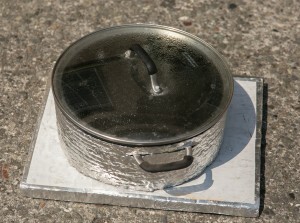 This technique for keeping the contents of the pot hot is called retained heat cooking, and the insulated container is often called a straw box cooker, since it could be made of straw. The solar preheater could incorporate sophisticated technologies like a vacuum insulated thermal panel, or simply a pot placed in the sun. For this experiment we used a retained heat cooker manufactured by “Nissan Thermos”. The 4 liter stainless steel inner pot is insulated by a double walled evacuated container. It is similar in design to many insulated coffee mugs. Since the insulated container is metal and heat resistant we could use it to insulate the rice while it cooked. This technique could be applied in developing countries or in the developed world. When I built my home 9 years ago, a zero energy home (http://www.sunfrost.com/extreme_efficiency.html), I applied this technique. Water is preheated by flat plate solar panels and the hot water is stored in a drain back insulated tank. A heat exchanger at the top of the tank collects the hottest water; it is then plumbed to the dedicated faucet at the kitchen sink. A 1/4“ copper tube minimizes heat loss and the time to receive the first burst of hot water. The electric burners are powered by a grid tied electric system. Wood gas stove with insulated pot. PV for fan on right. We applied our solar hybrid-cooking techniques to see how little wood we could use to cook a days worth of food. We assumed the average person consumes about 2400 Kcal per day. To simplify the experiment we also assumed 4 people in a family and 4 dishes were cooked per day and that each dish contained 2400 Kcal. We cooked a 2400 Kcal brown rice dish using our solar hybrid cooking techniques and measured the quantity of wood needed. Four cups of brown rice and 8 cups of water provide a days worth of calories, and 48 grams of protein. For a solar preheater we used a 12 inch diameter pot with a glass cover, to preheat the rice water mixture to 117 F, a temperature which would be easily achievable in a developing nation. The pot sat on a piece of foam insulation and the sides of the pot were insulated with “reflectix” insulation. 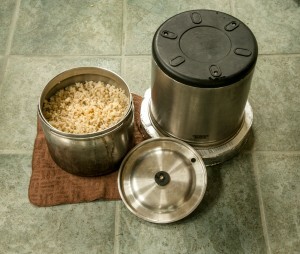 The rice was then heated to boiling temperature on a “wood gas” stove. 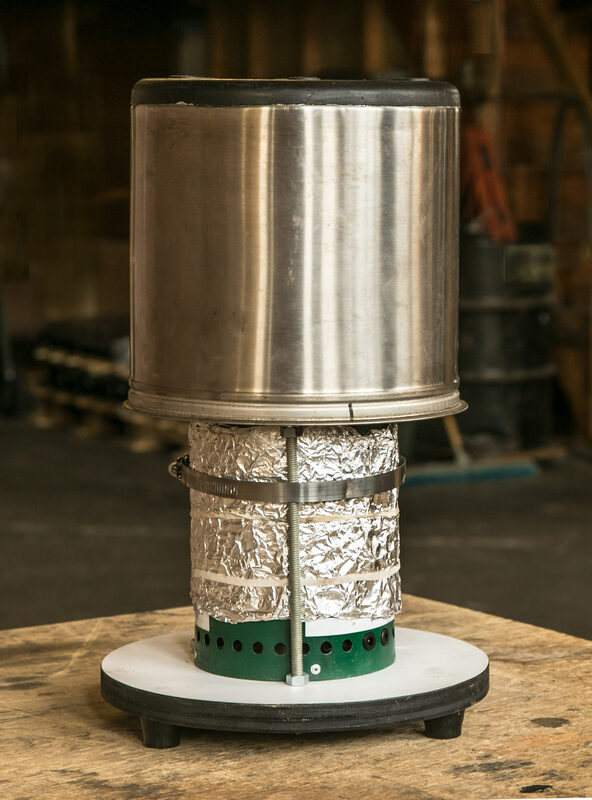 This stove is highly efficient and is commercially available. It incorporates a small fan which consumed ½ watt or less. The fan can be powered by a battery or a small solar panel. With a solar panel powering the fan the fan speed can easily be adjusted by partially covering the panel. Wood gas stove with insulated pot. Foil provides additional insulation for the combustion chamber. We removed the plastic parts from the Nissan container so it could be placed over the pot while cooking. This reduced heat losses from the pot to a negligible amount. With this technique we were able to cook efficiently even under breezy conditions. After the rice came to a boil we placed the pot on a piece of foil covered polyurethane insulation. We placed ½” tall spacers under the pot so that it was not sitting directly on the foam insulation. When the direction of heat flow is downward a horizontal air space is good insulation. Hot air rises so there is no convection in this space. Radiation heat transfer can easily be suppressed with aluminum foil on one of the surfaces and heat conduction through the air can make a relatively small contribution. When using a retained heat cooker it is more efficient to place the cover over the pot so there are no convective losses from seals in the top cover. We had perfectly cooked rice about 40 minutes later, the rice stayed hot enough for serving for several hours. 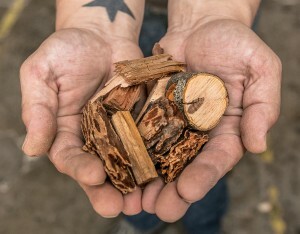 Wood required to cook a days worth of calories. This cooking process only required 3.8 oz (106 grams) of wood. This is a very small amount of wood, however there is considerable room for improvement since the process was only 26% efficient. If we eliminated the preheating and started with 70F water about 5.6 oz of wood would be required. We also tested this cooking technique using a standard cooking test for small wood stoves. In this test 1 liter of 70 F water is heated to boiling, the water is then kept at a simmering temperature for ½ hour. In this test we started with 70F water, it was not preheated. With the insulating cover no additional heat was needed to keep the water at a simmering temperature. We compared our test results to those presented in a summary paper where (link from Dan) 5 other stoves were tested. Our cooking technique used about half the energy consumed by the next best stove. These stoves did not incorporate an insulated pot or retained heat cooking. A “3 rock” open fire required about 5 times more energy. With solar preheating the energy consumed could have been further reduced. We are looking into how the insulated stainless steel container could be used to produce a highly efficient oven. The solar hybrid concept can be used in the developing world, and also in developed countries. It not only saves energy but also provides additional amenities. We hope it finds wider application. The Sun Frost CS composting toilet composts all of a households organic waste; both human manure and food scraps.